Dominant languages in South Africa. This map shows which languages are most spoken in the different parts of South Africa. South Africa has eleven official languages. They are Afrikaans, English, Ndebele, Northern Sotho, Sotho, Swazi, Tswana, Tsonga, Venda, Xhosa and Zulu. Most South Africans (over 99%) speak one of these languages as a first language. Most South Africans can speak more than one language. Prior to 1994, South Africa had only two official languages, English and Afrikaans. The English version of the South African constitution calls each of these languages by its name in that language. Zulu is called isiZulu, Xhosa language is called isiXhosa, and so on. 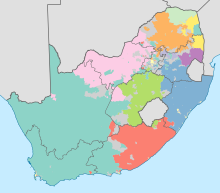 The languages listed in the constitution are: isiZulu (Zulu), isiXhosa (Xhosa), Afrikaans (Afrikaans), Sepedi (Northern Sotho), Setswana (Tswana), English (English), Sesotho (Southern Sotho), Xitsonga (Tsonga), Siswati (Swati), Tshivenda (Venda), and isiNdebele (Southern Ndebele). In South Africa, Southern Ndebele is known simply as Ndebele, since most speakers of Northern Ndebele live in Zimbabwe. The 1993 version of the Constitution referred to Northern Sotho as Sesotho sa Leboa, but the 1996 version called it Sepedi. Different government departments and official organizations use different names for Northern Sotho. The main language of government is English. Afrikaans and English are both important languages used in commerce. Most rich South Africans speak Afrikaans and English. Two of the official languages are West Germanic languages (English and Afrikaans). The other nine languages are Bantu languages. Four of the Bantu languages are part of the Nguni family (Zulu, Xhosa, Swati, Ndebele). Three of the Bantu languages are Sotho-Tswana languages (Northern Sotho, Southern Sotho, Tswana). Tsonga is a Tswa-Ronga language. South Africa also has a national sign languae, South African Sign Language. ↑ Census 2001: Census in brief (PDF). Statistics South Africa. 2009. p. 14. ↑ "Republic of South Africa Constitution Act 110 of 1983". Government of South Africa. 15 October 2004. Retrieved 2011-07-03. ↑ "Chapter 1 - Founding Provisions". Constitution of South Africa. Government of South Africa. 1996. Retrieved 2011-06-03. ↑ "Constitution of South Africa". Government of South Africa. 1993. Retrieved 2011-07-03. ↑ MULTILINGUAL NATURAL SCIENCES & TECHNOLOGY DICTIONARY (PDF) (1st ed.). Arts and Culture Department, Republic of South Africa. 2005. ↑ "What's Your LSM?". TVSA, The South African TV Authority. 30 May 2007. Retrieved 2011-07-03. This page was last changed on 12 January 2016, at 18:53.